At Pioneer Pump, Inc. we look at pumping applications from our customer's point of view. In waterlogged environments, sweltering heat, and industrial grime our pumps work to pump abrasive fluids, waste and debris. That's why qualities like reliability, durability, efficiency and ease of maintenance are built into every system we make. As the only U.S. pump manufacturer of its kind , assembly and manufacturing is done in Pioneer's manufacturing facilities to the highest specifications. We are fully equipped to handle custom applications and needs. Our commitment is to keep you up and running, day in and day out, in the toughest of environments. 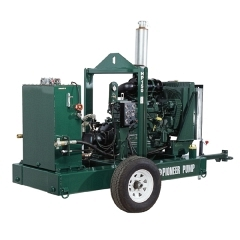 Whether you purchase or rent a Pioneer Pump unit, you can be confident that it has been built with your demands in mind. Vacuum Assisted Run Dry, Prime from Dry, Re-Prime Pumps - Available for Solids Handling or Clear Liquid Service. Sizes: 3 - 18 Inch. Flows: 200 - 18,000 GPM. Heads: to 500+ Feet. Typical mounting configurares are engine Driven for Skid or Trailer Mounted Packages and Electric Driven. Enclosed Silent Packages are available with DBA Ratings to 70 DBA @ 10 feet. 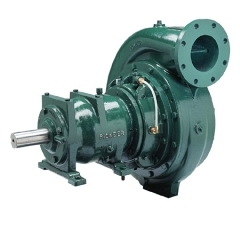 Pumps are also available in a variety of different metallurgies. Pumps and Power units available for Solids Handling or Clear Liquid Service. Sizes: 4-12 Inch. Flows: 200 - 7000 GPM. Heads: to 160 Feet. Power units available in skid or trailer mounted configuration Pumps also available in a variety of different metallurgies. Standard Self-Priming Pumps Available for Solids Handling or Clear Liquid Service. Sizes: 1 1/2 - 10 inch. Flows: 20-3500 GPM. Heads: to 200 Feet. Typical mounting configurations are Engine Driven for Skid or Trailer Mounted Packages and Frame Mounted Electric Driven. Pumps also available in a variety of different metallurgies. Bare pumps or packages are available. Sizes: 3 - 18 Inch. Flows: 200 - 18,000 GPM. Heads: to 500+ Feet. Standard End Suction Centrifugal Available for Solids Handling or Clear Liquid Service. Sizes: 1 1/2 - 18 Inch. Flows: 20 - 18,000 GPM. Heads: to 500+ Feet. Typical Mounting Configurations are Frame Mounted, Close Coupled Electric or Engine Driven. Pumps also available in a variety of different metallurgies.